GIBS have a specialized and dedicated QA framework that augments the development teams and is fully responsible to ensure the quality of the products and services. 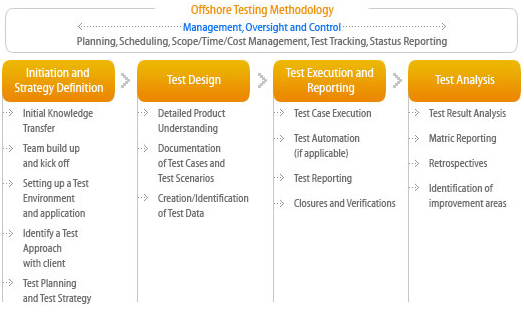 Through effective test planning, we create and maintain end to end test cases for carrying out testing activities. GIBS has also built a capability to ensure high level client satisfaction by establishing dedicated QA teams for outsourced testing services. We specialize in minimizing the risks, increasing productivity and extending strategic advantage to our global clients through state-of-the-art software testing practices. Our dedicated QA cell compliments client's development teams taking full accountability for the quality of the product. Our teams work seamlessly with the client's development team from project initiation to ensure that quality is not just tested into the product, but built into it. If you are looking to outsource either full or part of your software testing work, we are the ideal partner for you with the right processes, expertise and people to offer best value for your money.